In this work, the influence of particle surface charge density on the mechanism of bridging flocculation is studied. 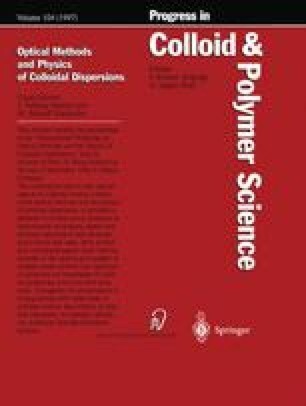 Different amount of bovine serum albumin (BSA) molecules were adsorbed onto the surface of two almost identical systems of polystyrene particles which differ only in their surface charge density. Flocculation was induced by adding a small amount of electrolyte to a dilute suspension. Single particle light scattering was used to monitor the flocculation processes. It was found that steric stabilisation does not prevent aggregation in all cases and at least some weak flocculation occurs. Nevertheless, it inhibits complete flocculation of the sample. The initial rate constants are obtained and it is shown that the constant kernel solution for Smoluchowski's system of rate equations cannot describe the flocculation processes. No clear evidence for bridging flocculation was found for the particles with low surface charge. For the higher charged particles, however, a pronounced maximum for the initial flocculation rate was measured at intermediate surface coverage. This finding gives clear evidence for bridging flocculation and that the particle surface charge indicater is a very important parameter for the formation of protein bridges between the particles.